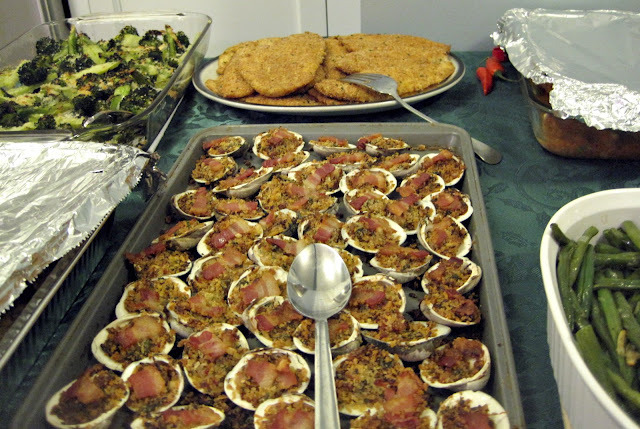 Baked clams with bacon, roasted broccoli with hot pepper flakes and garlic, and baked flounder. Christmas is just around the corner and if you’re celebrating an “Italian Christmas” then you’ve most likely heard of the Feast of the Seven Fishes. The traditional Christmas Eve dinner is steeped in folk tradition and as Maria Laurino writing for the NY Times has said, the ritual varies from region to region, including the number and type of fish served. Italian American holiday foods may contain some of the above items and I’m curious how you celebrate your Italian Christmas in the US? Please share via a comment and happy holidays! Oh, and if you’d like some guidance on how to shop for the best holiday foods see our guide on buying fruit, vegetables, and fish. Author: Vincent Scordo Lead Italophile (and/or lover of all things Italian). This year we are going to try having salted cod on christmas eve along with some salads and veggies. On Christmas day we’ll have ravioli, meatballs, salads, olive tray, salami tray, deviled eggs, and other munchy foods. But we’ll have panettone french toast, bacon, sausage and juice for bunch. We combine Amercian and Italian foods for our holiday meals and are forging a new path with our traditions. It’s making some great new memories for the next generations. OK now I’m hungry…auguri to you and yours, Vince! Michelle, I think that’s a great way to eat and celebrate. Our family does a few “new” things but the dishes are all pretty traditional: salted cod (fried and flaked with parsley, olive oil, and red onion), baked pasta dish or brodo, lots of vegetables, mussels, shrimp, fish salad, etc. for. Strongly recommend this site!